The real difference between Hillary Clinton and Bernie. One is running to lead the party as it is; the other is running to lead the party to the left. Hillary Clinton and Bernie Sanders before the debate in Flint, Michigan, on Sunday. Likewise, we knew Hillary Clinton would hesitate on big questions, instinctively choosing the more cautious option when confronted with a tough challenge. When an audience member asked Clinton what she would do to keep jobs in the United States rather than being shipped overseas, she replied with small measures to nudge manufacturers in her direction. “We’re going to have a very clear set of proposals and incentives for manufacturing so that we change the way that companies think about making investments again in America,” she said. Sanders, by contrast, took a broad swing. “Look, I was on a picket line in [the] early 1990s against NAFTA because you didn’t need a Ph.D. in economics to understand that American workers should not be forced to compete against people in Mexico making 25 cents an hour,” he said in a broadside against trade agreements like the North American Free Trade Agreement that have been backed by Bill Clinton. But, as viewers, we can learn from debates even when they cover familiar ground. And the Flint debate, in particular, illustrates an important difference between Clinton and Sanders that’s often overlooked in coverage of the two candidates but that goes a long way in explaining their campaigns and their positions. 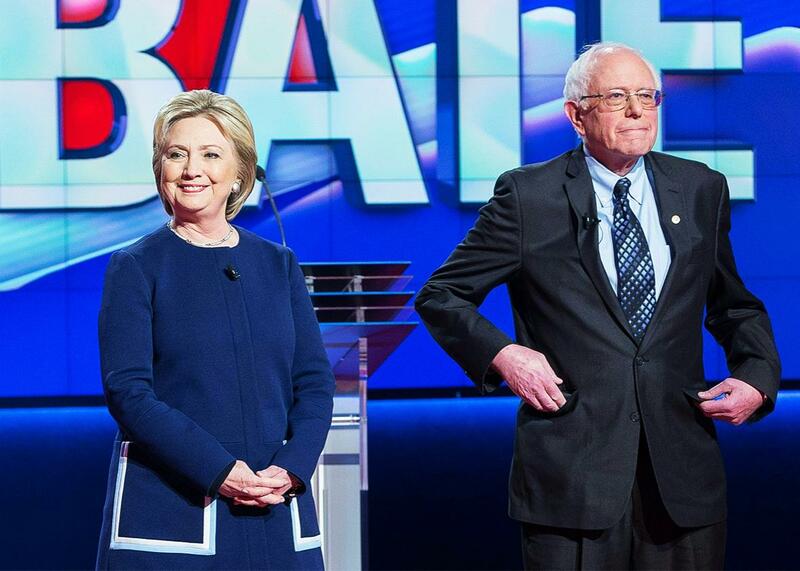 In short, Hillary Clinton is running to lead Democrats, and Bernie Sanders is running to lead liberals. Primaries obscure this, but parties are far more than their voters. They are the volunteers that give time, the donors that give money, the local and state officials that build organizations, the recruiters that find candidates, etc. They are also loose coalitions of groups and interests that work in tandem for common goals and, equally, work against each other for particular gains. Some are more powerful than others, and that influences the broad direction and shape of the parties. In addition to chief executive and commander in chief, the president of the United States is also the leader of his or her party. And as much as anything else, the president has to navigate these groups and interests, as well as communicate with other party members, from congressional leaders to local and state party officials. It’s why, to that point, the vice president often takes the lead in campaigning and fundraising for down ballot races—it is a show of commitment from the White House to the broader Democratic Party. Ambitious lawmakers do the same, campaigning for candidates and colleagues around the country. It’s why Massachusetts Sen. Elizabeth Warren, for example, stumped for Kentucky Democrat Alison Lundergan Grimes in 2014. Or why West Virginia’s Joe Manchin did the same for Louisiana’s Mary Landrieu. Presidential candidates hold a unique role. As prospective leaders of the national party, they set the tone for everyone on the ballot. What the presidential candidate (or nominee) says affects how House, Senate, and gubernatorial candidates shape their campaigns. You can read this as political cowardice from Clinton and courage from Sanders; or as evidence of their ties to entrenched interests (or lack thereof); or of Clinton’s cautious moderation and Sanders’ ambitious liberalism. But I think you can also read it as a reflection of their different positions in the Democratic primary, and their different goals as candidates. Hillary Clinton, a prominent leader from the ideological center of the Democratic Party, is running to lead the Democratic coalition as it exists. She wants to lead the party as much as she wants to be president. Which makes her more attentive to traditional party building—she’s pledged to devote resources to boosting state parties and candidates—and more cautious with her rhetoric. Liberals in the Democratic coalition are opposed to fracking, but many rural and purple state Democrats aren’t. Clinton doesn’t want to alienate either, so she tries to satisfy both. Bernie Sanders, by contrast, comes from the left wing of American politics with a nominal attachment to the Democratic Party—until his run for the presidency, he didn’t identify as a Democrat. He’s not as concerned with the usual party building and coalition maintenance. He wants to change the terms of the institution that is the Democratic Party and put ideological liberals at the fulcrum of Democratic politics, in the same way that ideological conservatives sit at the center of Republican politics. And so, his appeals are broad and expansive. He doesn’t worry about details as much as he focuses on energizing like-minded voters. Rather than trying to satisfy Democrats in conservative places, Sanders is trying to reduce their influence by attracting sympathetic voters (his “political revolution”). The problem for Sanders is that ideological liberals are one faction among many, and they compete for influence with party stalwarts like union members and black Americans, who offer support based on transaction—what can you do for the interests of our specific group—as much as belief. To win on his terms, Sanders has to grow the space for ideological politics in those groups and satisfy its more moderate and conservative members. This is hard (I call them “stalwarts” for a reason), and it’s why Sanders has had a hard time in states where they play an important part. But the problem for Clinton is that the Democratic Party isn’t just a loose coalition of interests. It’s more liberal than it has ever been, with a much larger space for progressive politics and action. And as Sanders has shown among white Democrats in the Northeast, and among young Democrats nationwide, that space is growing. This makes Clinton—a transactional politician who sits at the ideological center—an uncomfortable fit, who appeals to stalwarts and interest groups (like banks and industry) far more than voters who choose on ideology and belief. This isn’t a clean division. On guns, for example, Sanders has had to play the transactional politician to win in Vermont while Clinton has taken an ideological tack as a way to damage Sanders with liberals and tarnish his appeal as a purer politician. And this isn’t a conversation of “pragmatism” versus “idealism.” Ideological solutions can be pragmatic—advocates would say this for the “public option” in health care reform—while Clinton’s Democratic centrism represents a particular ideology of market capitalism as much as it exists to bridge party divides. But if you’re looking for a way to describe the current state of the Democratic race, this is it: a presumptive coalition leader versus a prospective ideological one.